Finding a beach that is not covered with umbrellas and lounge chairs is no small task in the Greek Isles. I found one on Patmos, where a friend of a friend led me as if I was being taken to a secret hideout. It was small and rocky, the water clear and blue--just what you would imagine Greece's islands to be like. "Imagine" is the key word here. It was among the few beaches I came upon that was not conquered by row upon row of plastic chairs and umbrellas during my sojourn around the Aegean this month. Maybe it is just me who thought this was not a good thing. A French woman and her husband, who arrived on a cruise ship and accidentally stumbled upon the same "secret" Patmos beach in their rental car, left in search of a better place. She told me she was uncomfortable on a beach without a lot of chairs and umbrellas. "It just does not feel like a real beach to me," she explained. It would be funny, if it were not so serious. On Santorini, perhaps the most picturesque island in the world, cruise ship passengers off load by the tens of thousands each week during summer, tavernas serve Mexican tacos, and a gondola races tourists up the steep cliff once accessible only by hiking up or riding a donkey, as the Greeks did for centuries. At the base of Fira town, a cruise ship rests dead underwater, where it sank last year, still spewing toxins, while the Greek government has yet to take real action to get it out of there and limit further environmental damage. According to a geologist I spoke with, the cruise ship sits on the edge of an underwater ledge--the sunken caldera of the ancient Thera volcano. One shake from a small earthquake--which are common in the region--can tip it into an marine abyss where the pressure will burst its fuel tanks, creating an ecological crisis. Meanwhile, permission is being granted for more and even larger cruise ships to disembark at Santorini. Concrete hotels are mushrooming over what's left of the island's traditional family vineyards. At Dimitri's Taverna, which I was told was one of the only authentic Greek family tavernas remaining on Santorini (located in Amoudi), I found Dimitri grilling fish during a busy evening serving tourists. I asked him where I could find real Greece in Santorini today. He looked at me, a big burly Greek man, and replied, "It does not exist here anymore." When I said that I was told that his place was one of the last remaining true Greek tavernas on the island, he sighed, adding, "Not here either. Show me a Greek taverna anywhere that puts catsup and mayonnaise on the tables. It breaks my heart. I put olive oil and lemon on each table as we did when I grew up, but the tourists just ask for catsup on their potatoes and mayonnaise on their fish. We give them what they want." Greece tourism is becoming a modern Greek tragedy. At a time when more enlightened tourism destinations in the world are rethinking their tourism strategy according to the principles of sustainability and maintaining authenticity, Greece tourism officials seem to be lost. More sun and sea mega-resorts, condos, and ever bigger hotels continue to drive the country's tourism development. It is a classic cycle of "kill the goose that lays the golden eggs," while taking all you can today without planning for tomorrow. In the process, Greece may lose what matters most to Greeks and to the country's tourism economy: their own cultural identity and the natural beauty that has been the foundation for tourism. All is not lost--yet. Here are some tips on how you can experience Greece on a more authentic level. Getting There: Flying to Athens can be expensive, especially these days. But Greece native, Georgia Nomikos, who runs her own independent travel company, Sea and City Travel (info@seacitytravel.com), in New York City, knows every conceivable way to get to there. Tap into her expertise to find the best ticket and route. She also organizes private culinary and art tours. Athens: Forget about tourist joints in Plaka serving Greek salads and souvlaki. Head to Archaion Gefsis, the only restaurant that serves a true menu based upon the cuisine of ancient Greece. You will not find plates of feta, Greek coffee, or baklava here. But you will experience a culinary journey into history with dishes that are as sustainable today as they were when the ancient Greeks ate them during Socrates' and Plato's day (www.arxaion.gr). Patmos: Because Saint John the Theologian holed up in a cave here in AD 95 and wrote Revelations, the Greek Orthodox Church has kept tight limits on tourism to protect it as a pilgrimage site. Cruise ships do disembark on Patmos and a few charter buses cart their passengers around, but the island remains a hub of traditional culture. Yiannis Kamaratos, ( local tel. 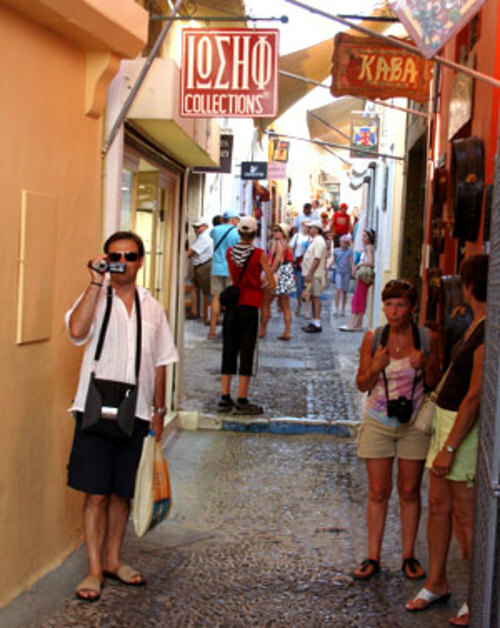 6932321710) organizes outings and remains actively engaged in keeping tourism under control on Patmos. 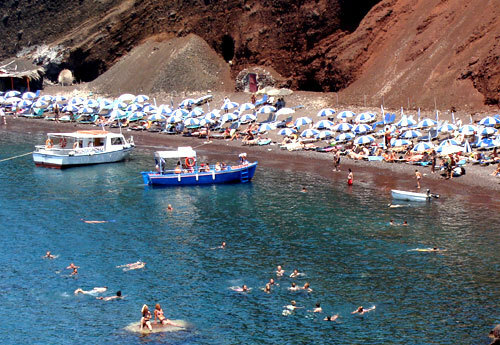 Santorini: Why go here at all? The view from the cliff towns of Fira and Oia looking into the blue water caldera below is unique in all the world. That view has been Santorini's blessing and its curse: hoards of tourists come just to say they where there. If you go, stay at Nomikos Villas (www.nomikosvillas.gr), owned by a family who have called Santorini home for generations." Tourism development on Santorini should have stopped 10 years ago," says owner George Nomikos, explaining why he supports a ban on any new buildings. Crete: Head to the hills, specifically to Milia, where two passionate Cretans (Giorgos and Tassos) have restored an abandoned stone village high in the mountains, creating a model for sustainable tourism practices. Expect real Greek hospitality and rural rusticity, organic foods and local wines. Great hikes surround Milia. To explore the rest of the island and also support efforts to protect its cultural and natural heritage, contact Crete's Culinary Sanctuaries (www.cookingincrete.com). What started with Greek-American chef, Nikki Rose, offering learning tours about the Mediterranean diet ( i.e. way of life), has evolved into an island-wide sustainable tourism network based on years of experience. Don't expect free travel advice, but what you pay for (CCS also runs tours) supports local villagers. Island Exploration: Yiannis Skevis, President of Aegea Adventures (www.aegeaadventures.com) knows what is at stake in Greece and is passionate about promoting a new tourism vision that gives back to local communities and helps protect nature - offering mountain biking, sailing, hiking and climbing all through the Greek islands and on the mainland. Carrión will have to work to avoid the same problem in this newly created position. I wonder how great it would be to come and try it! Love beaches! It is a pity, I always loved the essence of all things Greek, the simple food, the islands with authentic Greek style. I agree with your blog because Greece is one of the nice place. where was the pictures shot? Hawaii but never been to Molokai- even the mane is wonderful! I hope they will find a way to keep and maintain their lovely society! I do not want anything out of it especially money coz i have enough to satisfy my needs. LOL! The French woman who thought it wasn't a real beach because there were no chairs and umbrellas HAHA! I guess there are some people who just don't know how to rest and enjoy themselves. I will then publish it on the internet and publicize it by his/her name and lyrics will be mine. me that he is well prepared and knows what he's doing. But Don if you break a leg, don't come running to me ! The government and their developer-affiliates ignore these facts. They continue to increase, rather than decrease unsustainable tourism projects. Meanwhile, many regions and islands have completely run out of natural resources, including fresh water. The Greek government wholeheartedly supports this project and others like it. It seems that no one can stop the bulldozers. South Africa where each staff member is actually a volunteer as they need to raise their own support. None are given a salary and therefore it is difficult to get staff willing to work under these conditions. You sure know what you are talking about and it is through you that i could grasp the full impact of such things.